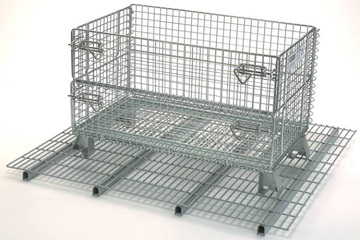 Wire, solid, slotted or perforated rack decks? What is the role of rack decking? Most people install rack decking to increase safety, stability and versatility. A rack bay with decking is more forgiving to drivers who load pallets on a high bay, far beyond visual confirmation that they have the pallet square on the beams. Decking, if specified correctly, can provide them assistance in centering the load right so that it’s safer and more stable. The versatility options are also very useful. Many warehouses have multiple load types. So long as the decks are specified correctly, they can hold smaller pallets, containers, and other loads that don’t quite fit on the beams. They also allow for split cases, boxes, components or cartons that need support to sit in the rack system. This gives them versatility that pallet supports lack. Pallet supports are usually used strictly to add rigidity beneath a load that may require it. Decks are also used to help catch falling loads, adding a second layer of safety for workers below. Also, metal decks do not add to fire dangers the way wood sheets do, since they aren’t combustible. Aside from size (most deck types offer a good range of sizes), your first filter should be capacity: how much weight can your decking solution hold? You should understand your load characteristics and what it will take to carry it. Wire decks can hold a variety of loads, with capacities ranging (depending on type) from 2,200 to 3,650 pounds. This gives it more weight-bearing capacity than most perforated and solid steel choices, but not quite as much as the heavier slotted options (max of nearly 4,000 pounds). Read our guide to loading rack decking to understand your load type/situation. Wire decking gives you toughness and durability along with the flexibility to store cartons, drums and multiple pallet sizes on the same rack beam. When you install wire decking, your rack bays suddenly become much more flexible and usable, which can aide in efficiency and storage. This decking is perfect when you have a sprinkler system—it’s easy for sprinklers to bypass the open wire mesh construction and cover down right to the floor. Wire decks are the industry standard. In the past, they were almost always the best options, when compared to the practice of using plywood or particle board decks, but today there are many other decking types available for specific applications. Wire is usually the most economical of decking choices, and offers more air flow than other options. Wire is also made in more standard sizes than most other decking options available on the market, but most deck types can be built to any needed dimensions. A heavy duty alternative to wire decking, the slotted open steel deck provides more surface area contact with the product, which can help prevent possible damage and provide greater strength. The 22-gauge galvanized steel is fire protection friendly with its 50% open design. Made to fit a 42″ deep rack bay. Perforated steel decking allows for bays to be used for bulk storage, bagged goods storage and small item storage that would fall through the openings of traditional wire decks. Decks are made from 14 gauge steel with 1″ perforations and 12 gauge steel reinforcing channels on the underside to provide a capacity of 3,000 lbs. per section. A powder-coated gray finish gives the decks a polished surface so stored items will not be damaged and the waterfall edges on the front and back are 1-1/2″ to ensure a secure fit to the 1-5/8″ step beam. The smooth powder coated surface of solid steel pallet rack decking allows for bays to be used for bulk storage, bagged goods storage and small item storage that would fall through the openings of traditional wire decks. These decks are made from 14 gauge steel, with 12 gauge steel reinforcing channels on the underside to provide a capacity of 3,000 lbs. per section. Waterfall edges on the front and back are 1-1/2″ to ensure a secure fit to the 1-5/8″ step beam.